The Foundations of Female Entrepreneurship explores the relationship between home, household headship and enterprise in Victorian London. It examines the notions of duty, honor and suitability in how women’s ventures are represented by themselves and others and engages in a comparison of the interpretation of historical female entrepreneurship by contemporaries and historians in the UK, Europe and America. It argues that just as women in business have often been hidden by men, they have often also been hidden by the ‘home’ and the conceptualization of separate spheres of public and private agency and of ‘the’ entrepreneur. Drawing on contextual evidence from 1747 to 1880, including fire insurance records, directories, trade cards, newspapers, memoirs, the census and extensive record linkage, this study concentrates on the early to mid-Victorian period when ideals about gender roles and appropriate work for women were vigorously debated. 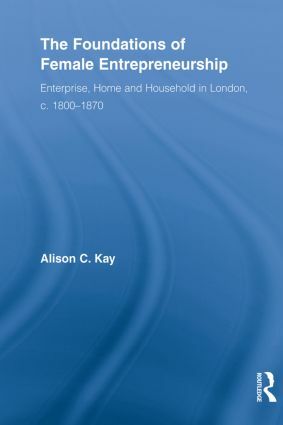 Alison Kay offers new insight into the motivations of the Victorian women who opted to pursue enterprises of their own. By engaging in empirical comparisons with men's business, it also reveals similarities and differences with the small to medium sized ventures of male business proprietors. The link between home and enterprise is then further excavated by detailed record linkage, revealing the households and domestic circumstances and responsibilities of female proprietors. Using both discourse and data to connect enterprise, proprietor and household, The Foundations of Female Entrepreneurship provides a multi-dimensional picture of the Victorian female proprietor and moves beyond the stereotypes. It argues that active business did not exclude women, although careful representation was vital and this has obscured the similarities of their businesses with those of many male business proprietors.